Welcome to Week 5 of the Northanger Abbey read-along - our last week! You can check out previous read-along posts HERE. Today we're going to discuss chapters 25-31. If you came prepared, go ahead and share your thoughts below! Otherwise, feel free to check in later, after you've had a chance to read the final chapter. Can't wait to hear your thoughts! P.S. 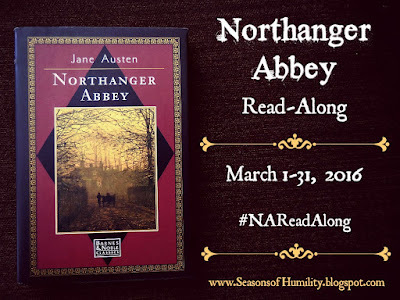 If you're a blogger, you're more than welcome to put together your own post using the button above and linking back to the Northanger Abbey read-along tag, if you'd prefer to participate in the discussion that way. Discussion Format: One favorite quote, some general impressions, and three questions for each week's reading. "Her father, mother, Sarah, George, and Harriet, all assembled at the door, to welcome her with affectionate eagerness, was a sight to awaken the best feelings of Catherine's heart; and in the embrace of each, as she stepped from the carriage, she found herself soothed beyond anything that she had believed possible." Can you believe we've reached the end?? We've watched Catherine recover from her mortification. We've experienced her joy in visiting Henry's home and parish. We've witnessed the true horror of this Gothic parody - that of being unkindly banished from Northanger Abbey for no reason other than a lack of wealth in General Tilney's eyes. Since this is my second time through the book, and since I've seen the 2007 movie on numerous occasions, I can't really speak to my surprise on any of these final revelations. But it's been fun to reunite with these characters and to read your impressions of them! Some of his remarks in the book do come across as perhaps a bit too mocking or patronizing... But I love that he has a genuine affection for Catherine and a proven loyalty to her. He desires to see her taken care of, both emotionally and physically. And he has a soft spot for his sister and reading! Speaking of Eleanor, her character stood out to me a lot in this reading. She's such a genuinely kind person, and she provides a beautiful example of friendship and family love in the wake of Isabella's betrayal. I'm happy for Eleanor, that she finds someone equally charming to settle down with! Feel free to answer one, two, or all three of these questions in the comments section or in a separate blog post! 1. How would you respond to General Tilney's rudeness if you were: Catherine? Eleanor? Catherine's parents? 2. How do you feel about Henry Tilney by the end of the story? What do you think of his home in Woodston, his response to his father's actions toward Catherine, and his initial reasons for pursuing her? 3. The final line of the book states, "I leave it to be settled by whomsoever it may concern, whether the tendency of this work be altogether to recommend parental tyranny, or reward filial disobedience." What is your verdict? Do you believe the story recommends parental tyranny or a child's disobedience? What do you believe is the book's real message? What's a watch-along, you ask? Basically, we'll meet up on Twitter and begin watching Northanger Abbey (2007) at the same time, proceeding to tweet our observations, favorite quotes, and reactions. It's the next best thing to actually getting all your blogging friends together in front of the TV in your living room! Who: You, me, and whoever wants to join in! When: Tonight at 5:30 p.m. PST / 8:30 p.m. EST! Why: Just one name: JJ Feild. You will fall in love with Henry Tilney all over again! It's been such a blast re-reading this book and discussing it with you all! I've enjoyed your thoughtful comments and blog posts, and I sincerely appreciate you joining me on this journey. I hope you've enjoyed the experience, too! I'm hoping to discuss more Jane Austen books with you in the future. :) I currently have Emma, Mansfield Park, and Pride and Prejudice on my TBR shelf! Welcome to Week 4 of the Northanger Abbey read-along! You can learn more about our read-along plans in this invitation post. Today we're going to discuss chapters 18-24. If you came prepared, go ahead and share your thoughts below! Otherwise, feel free to check in later, after you've had a chance to read today's chapter. Can't wait to hear your thoughts! So much - and yet so little - happens in these chapters! This section begins with the Isabella situation. Catherine witnesses the attentions Captain Tilney (Henry's brother) gives to Isabella...and the way Isabella doesn't exactly refuse them. More like responds to them. Flirtatiously. Which doesn't really set right with Catherine, thinking of her own dear brother and how his feelings would be crushed. :\ Isabella's true colors are finally coming to light for our heroine, who tends to think the best of everyone but can't quite dismiss this incident. Catherine tries to get Henry to talk to his brother, but Henry declares that Frederick knows what he's doing and has to make his own choices - as does Isabella. So Catherine eventually accepts this and embraces the happy (?) distraction of her visit to Northanger Abbey. One of the best scenes in this section, in my opinion, is Henry and Catherine's conversation in the curricle on the way to the abbey. First of all, it sounds like Henry is a much better driver than Thorpe. (Are we surprised? Um, no.) Second, Henry is quite the storyteller! He takes his teasing to a whole new level with the imagined proceedings of Catherine's visit at Northanger. The best-best part is when he has to stop because he's too amused by Catherine's reactions. ;) Can't you just picture the smiles and chuckles? And Catherine's return smiles and blushes? Eventually, they arrive at Northanger Abbey, which is not quite all Catherine expected. There is some mystery...or is there? There are some horrid secrets...aren't there? And where on earth is all the dark, ancient, terrible beauty of Catherine's beloved Gothic novels? There are some close calls and lots of descriptions of the location...and we end with the culmination of Catherine's carried-away fancies: the disappointment and disbelief of dear Henry. 1. If you were Captain Tilney's sibling, would you say something to him about his behavior toward Isabella? Or if you were Isabella's friend, would you try to warn or correct her? What do you think of Henry's reaction to Catherine's concern about the situation? 2. After reading all about Northanger Abbey, what are your thoughts of the place? Is it anything like you were expecting? Would you ever want to visit or live there if you could? 3. How do you feel about Catherine's thoughts and behavior in this section? Was it all harmless intrigue, or do you thinks it's possible to be too caught up in daydreams and fictional worlds? *Note: I hope this time works all right for everyone! Because I work until 5:00, I can't really start much sooner, and I know we wouldn't want to start any later, or we'd be keeping the East-Coasters up all night! But if the details change, I'll be sure to let you all know. Want a chance to win the 200th-Anniversary Annotated Edition of Emma by Jane Austen? You can log your entries using the Rafflecopter form below. (Giveaway open to US residents only.) The winner will be announced on March 31st. Good luck! Join us next Thursday for the final discussion! We'll be chatting about chapters 25-31. 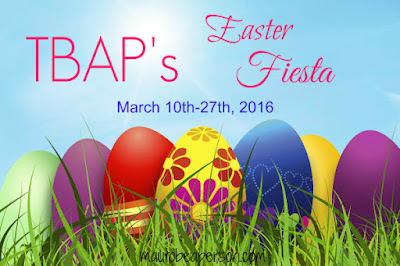 Chat with Your Favorite Authors During This Easter Fiesta! Are you on Facebook? Then gather up your burning questions for writers, actors, and other artists you admire, because my dear friend Miranda is hosting a fabulous chat celebration! Be in the know and discover all the details below. ;) And be sure to pull out your planner so you can note the conversations you want to join! TBAP’s (To Be a Person) Easter Fiesta is a social media event where the professionals of the literary and entertainment industries give back to the audience that has supported them over time, by chatting with the audience through TBAP’s social media on a set date/time. For 2016, it’s TBAP’s Facebook page! The professionals are drawn from the following categories: authors, actors, alliances. music artists. Miranda A. Uyeh is the author of To Die Once: Child of Grace #1, a book/entertainment blogger, and a Mogul Global Ambassador. She’s passionate about all these and even found herself to be shortlisted as one of the Inspy Awards’ Judges in 2014. You can connect with Miranda on Twitter, Facebook, Google+, YouTube and Pinterest, or visit her corner of the web, TBAP! Tweet at @Rini_MAU and use the hashtag #TBAPFiesta, or update your Facebook status by using the hashtag #TBAPFiesta and tagging your post with Miranda Afa Uyeh or Miranda’s To Be A Person. You can also post directly on TBAP’s Facebook page. P.S. For some lovely inspirational messages from some of the guests (just for you! ), check out TBAP’s official YouTube channel! Don't miss this opportunity to talk with talented individuals who have made a name for themselves in the book and entertainment industries! All the chats will be happening on the TBAP Facebook page. 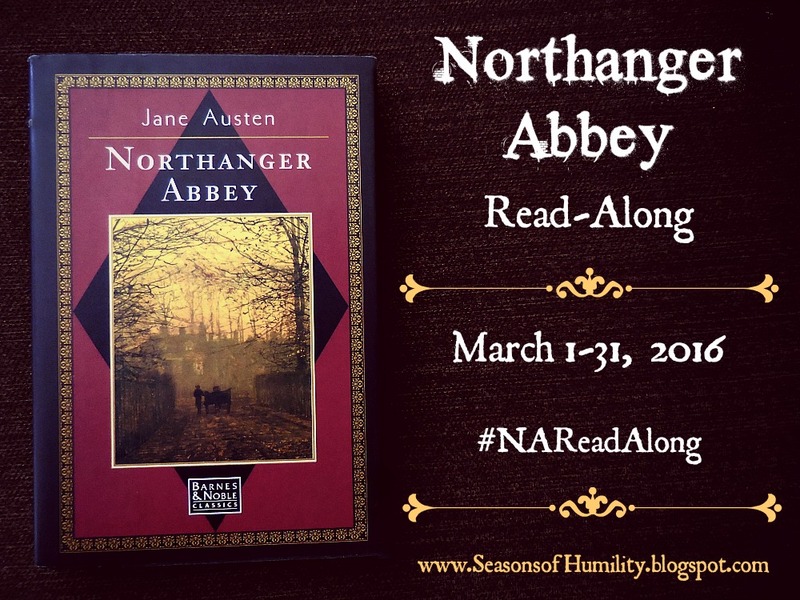 Welcome to Week 3 of the Northanger Abbey read-along! You can learn more about our read-along plans in this invitation post. Today we're going to discuss chapters 11-17. If you came prepared, go ahead and share your thoughts below! Otherwise, feel free to check in later, after you've had a chance to read today's chapter. Can't wait to hear your thoughts! "Catherine...enjoyed her usual happiness with Henry Tilney, listening with sparkling eyes to everything he said; and, in finding him irresistible, becoming so herself." 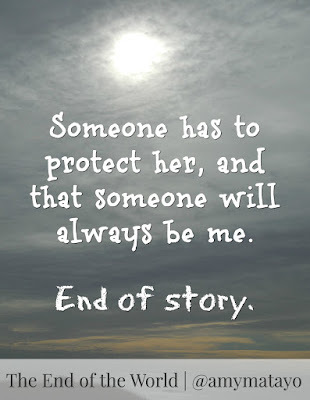 But nothing keeps our heroine down for long. :) She will make her desires clear and take that walk, no matter how many times she must set the record straight! I love that Catherine makes a stand in these chapters - striving to remain kindhearted about it, but still determined to keep her commitments, express her true wishes, and be honest about the situation. Meanwhile, she remains sweetly naive about the machinations of those around her. This section also includes an intriguing conversation about novels and reading; the announcement of James and Isabella's engagement (reactions to this, anyone? ); a reluctant (??) dance between the handsome Captain Tilney and Isabella; and an invitation issued to Catherine to visit none other than Northanger Abbey, home of the Tilneys. 1. How do you feel about the way Catherine handled herself with John, Isabella, and James when they pressured her into ditching her walk with the Tilneys in favor of their own outings? How do you feel about the way she explained herself to the Tilneys? 2. Henry, his sister, and Catherine have an interesting discussion about books and education on their walk. What was your favorite part of that conversation? Did any of their opinions on novels, history, or the difficulties in learning to read resonate with you? 3. We've been given more glimpses into Henry's character - as well as Catherine's infatuation with him. Do you think Catherine has fallen too hard too fast? Or do you think Henry is proving himself worthy of such admiration? Next up is a chance to win the 200th-Anniversary Annotated Edition of Emma by Jane Austen. You can log your entries using the Rafflecopter form below. (Giveaway open to US residents only.) The winner will be announced on March 31st. Good luck! Join us next Thursday to chat about chapters 18-24! Welcome to Week 2 of the Northanger Abbey read-along! You can learn more about our read-along plans in this invitation post. Today we're going to discuss chapters 4-10. If you came prepared, go ahead and share your thoughts below! Otherwise, feel free to check in later, after you've had a chance to read today's chapter. Can't wait to hear your thoughts! "For though she could not, dared not, expect that Mr. Tilney should ask her a third time to dance, her wishes, hopes, and plans all centred in nothing less. Every young lady may feel for my heroine in this critical moment, for every young lady has at some time or other known the same agitation. All have been, or at least all have believed themselves to be, in danger from the pursuit of someone whom they wished to avoid; and all have been anxious for the attentions of someone whom they wished to please." I would say chapters 4 through 9 can be summed up in one word: thwarted. Poor Catherine's dreams and plans seem to be thwarted at every turn. Mr. Tilney leaves Bath without so much as a "by-your-leave." Mr. Thorpe arrives and commandeers Catherine's attention most rudely. And Catherine misses one opportunity after another for reacquainting herself with the fun-loving (but gentlemanly) Tilney. How real do these scenes feel to you? I know I can certainly empathize! When your romantic daydreams go awry, spend time with your friends. Not all attention is good attention. The joy of a date/dance depends on whom you're with - not just the fact that you're with someone. Don't be too quick to assume. There could be all sorts of reasons why things haven't worked out. And then there are lessons she's still in the process of learning, particularly when it comes to her awareness and insight into the ways of people like Isabella and John Thorpe. I'll sum up my feelings toward Mr. Thorpe in one word: Ugh. 1. Is Isabella a friend or a "frenemy"? Do you think there's the seed of a genuine friendship between her and Catherine, or is Isabella only loyal to her own ambitions? 2. Let's talk about John Thorpe, whose presence is obviously a problem! How would you advise Catherine in her interactions with Mr. Thorpe? 3. Do you agree with Mr. Tilney's comparisons between dancing and marriage? And do you consider dancing an important component of romance? Join us next Thursday to chat about chapters 11-17! Welcome to Week 1 of the Northanger Abbey read-along! You can learn more about our read-along plans in this invitation post. Today we're going to discuss chapters 1-3. If you came prepared, go ahead and share your thoughts below! Otherwise, feel free to check in later today or tomorrow morning after you've had a chance to read today's chapter. Can't wait to hear your thoughts! I love how Catherine's situation is introduced. Everything is quite...ordinary. Catherine is the heroine of her own story, but she doesn't have any "exceptional" qualities or extraordinary circumstances to make her tale exciting. Perhaps the modern equivalent would be a real-life YA heroine with no super powers, no guys competing for her affection, and no incredible destiny to save the world (see #RealisticYA). I can totally relate to Catherine's experiences. Her first ball involves annoying crowds, a tragic lack of a dance partner, and no one to talk to but Mrs. Allen. And yet, the night isn't a total loss, because she overhears two gentlemen calling her "pretty." It's the little compliments and attentions that we tend to hold dear...and it's amazing how even a small display of attention can turn the night around! He seemed to be about four or five and twenty, was rather tall, had a pleasing countenance, a very intelligent and lively eye, and if not quite handsome, was very near it. He sounds like my kind of guy! But what I really love about Tilney is the teasing. No one flirts in such an adorable and gentlemanly way like he does. ;) He pokes fun at convention, engages in witty banter, and makes Catherine laugh. In my book, I'm quite pleased with these first impressions. 1. What do you find most endearing about Catherine's character? Do you consider her to be good heroine material? 2. What are your first impressions of Mr. and Mrs. Allen? What sort of impact do they have on Catherine? 3. Has Mr. Tilney already stolen your heart, or are you still forming your opinion of his character? Which of his positive or negative qualities stand out to you most? Do you consider him to be good hero material? Join us next Thursday to chat about chapters 4-10! For good reason. It doesn’t take long for Cameron to learn that Shaye is shackled to the worst kind of pain...living in a home where nothing seems right. And now he’s joined her with no way out. Their only refuge is a lake, a quiet spot at the edge of the property where they can sit together for a few moments at the end of each day. Alone with their thoughts. Away from prying eyes. This story is about regrets...things left unsaid...unspeakable sorrows and the power of a love that never completely gives up. It's about kindness that reaches so innocently toward tragedy and somehow makes all the difference. - Pain at lost childhood, horrible secrets, and accusations. - Desperation to cling to the sweet moments between two unlikely friends who need each other. - Sorrow at tragic revelations and unspoken goodbyes. - Frustration as the same mistakes and hurtful choices are made over and over and over again. 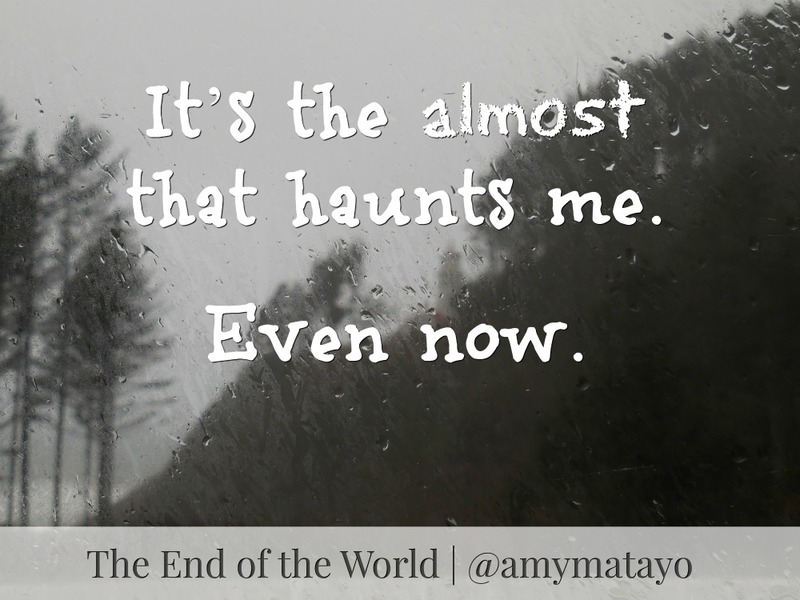 - And yet, hope, meeting Shaye and Cameron at the end of the world. 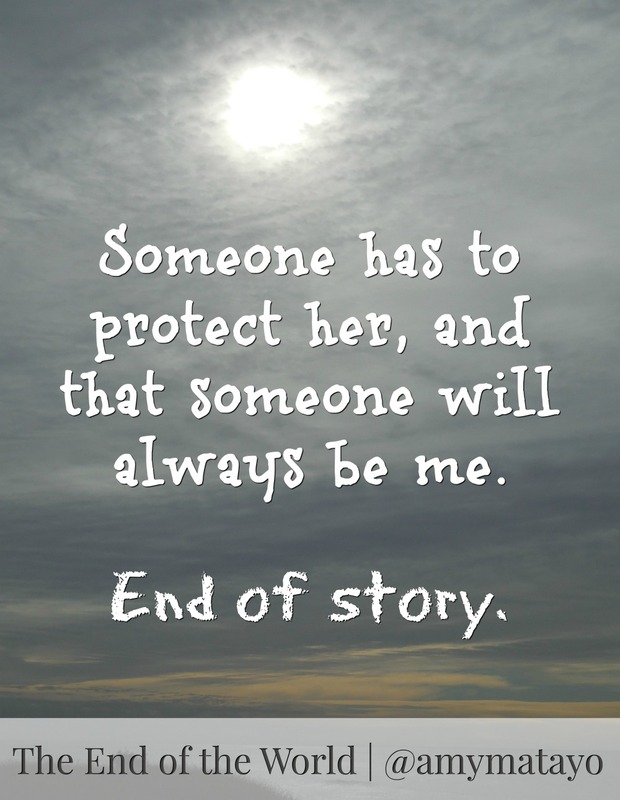 This is an intense story, both in the events that happen and in the relationship between the two main characters. It's not for all readers, but for those who do pick it up, a great deal of perspective, compassion, and reality await between the pages. While the plot is heavy with choices that fall one by one like dominoes, there is a tender lightness in its portrait of friendship. 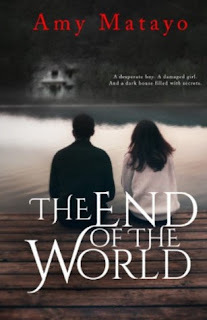 The End of the World exposes the shadows that haunt a life...and reminds us of the unrelenting love that can set a life free.